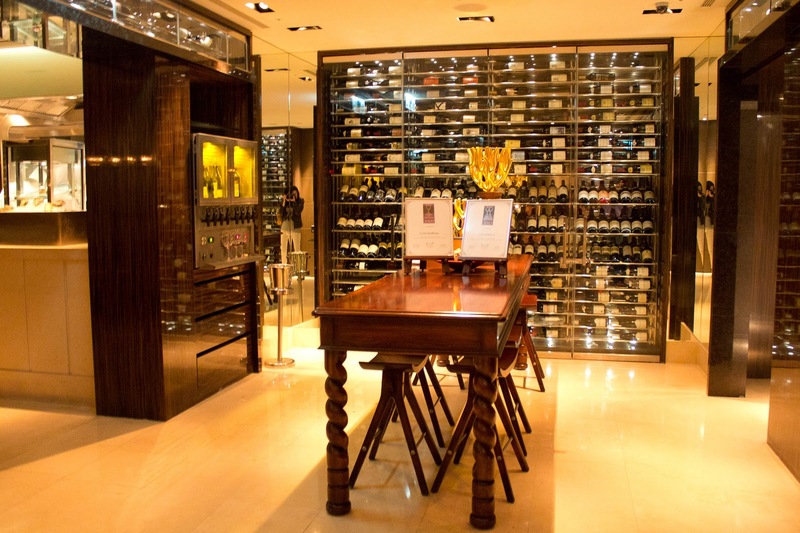 Located in the opulent Ambassador Hotel in Taipei, A Cut Steakhouse is nestled in the basement of the hotel away from the hustle and bustle of incoming and outgoing guests. I have to apologize in advance for the photos...I post the food reviews out of order and I think my skill with the camera has gotten better since this particular meal. From the staff to the decor the restaurant exudes a sort of modern classiness. The waitstaff all have prim and proper uniforms, while the somalier and Maître'd are uniformed in suits. 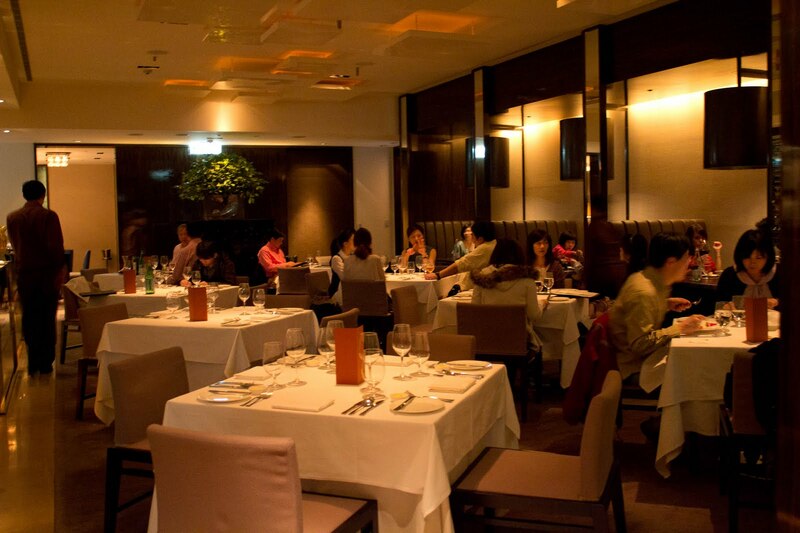 The service was impeccable and the entirety of the waitstaff was very attentive, knowledgeable and ready to help. I find when a waitstaff excels at their job, the diners do not mention it. It's only when they go above and beyond average service or, to the other extreme, of terrible, terrible service is the only instance when people mention it. Good service goes unmentioned. =) ~<3 So thank you polite, efficient servers of the world! A Cut utilizes a color palette of chocolate brown, beige and cream, while the entire restaurant is "dimly lit" for a romantic and intimate atmosphere. 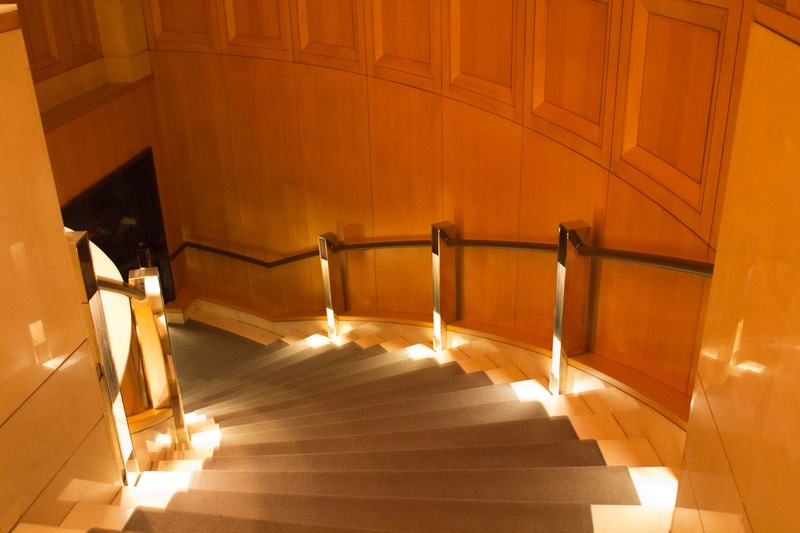 A Cut incorporates lots of clean materials: leather, stainless steel, and marble into the restaurant's overall theme and design. You'll notice leather booth seating, a leather menu, stainless steel salt and pepper shakers, and other stainless steel accents around the room. Every time that my farther and I come here, we always make sure to order the two person tasting menu. The set includes bread, an appetizer, a soup or a salad, a meat or seafood main, a side dish, and a dessert. 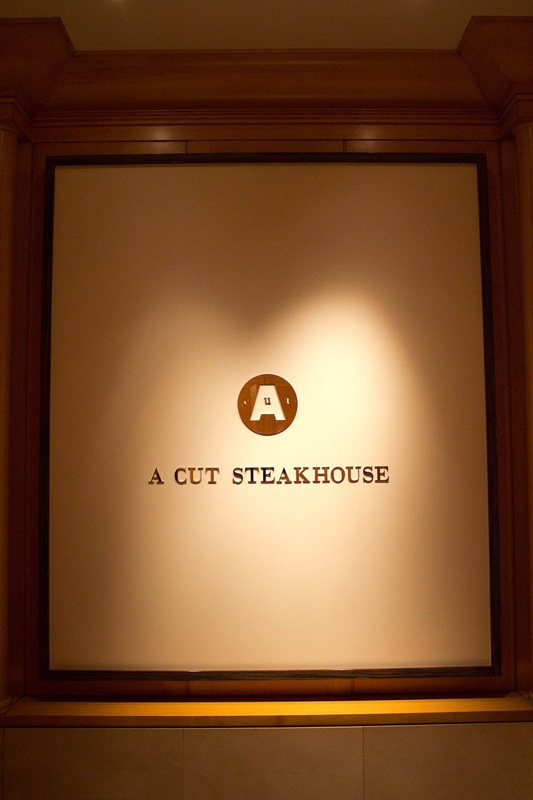 A Cut House is definitely guaranteed 100% delicious, but it is also definitely a once in a while splurge. 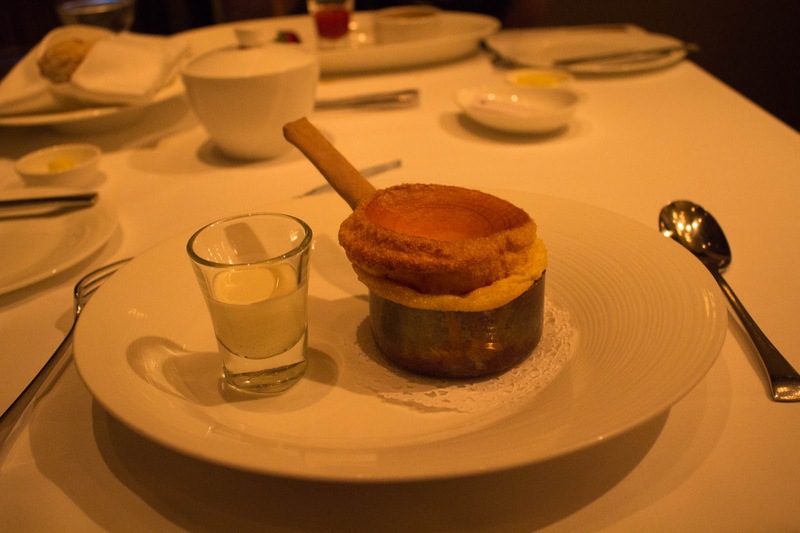 The execution of each dish is precise and the presentation is delicate. 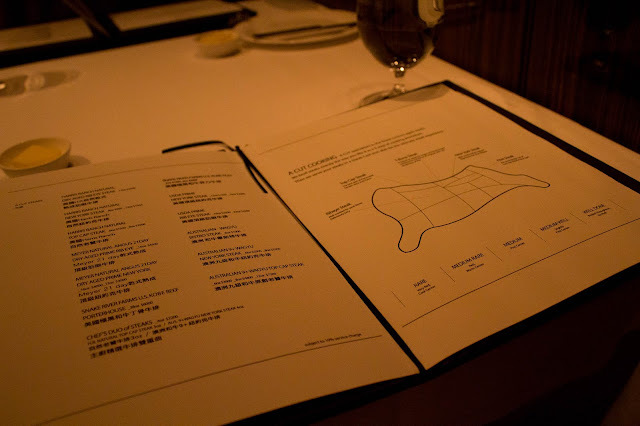 Eating a meal at A Cut steakhouse is a genuine treat for the eyes and the palette. 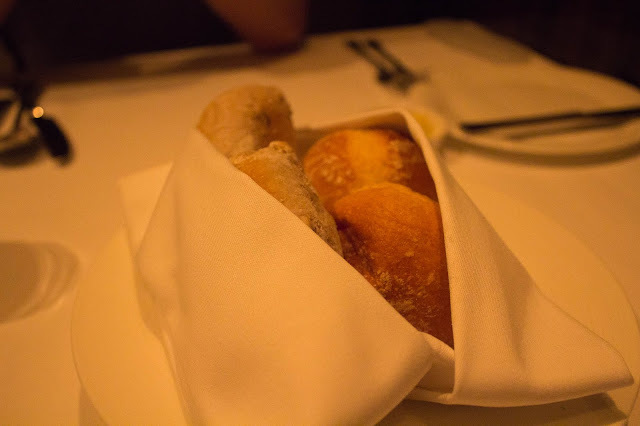 One thing that I love, love, love about A Cut steakhouse is that they make their bread fresh, they have a full service bakery upstairs, and they deliver the little golden nuggets to your tables warm and piping hot. 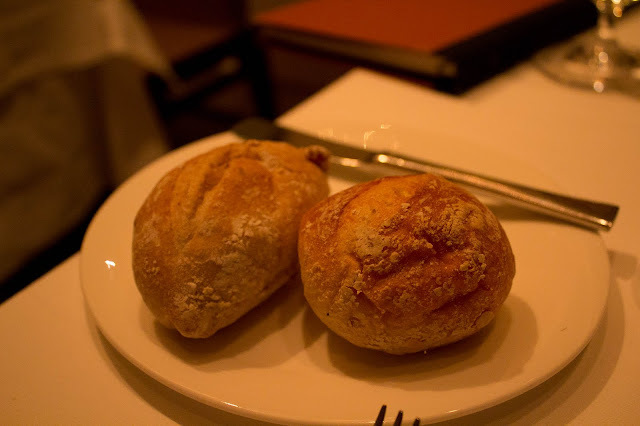 The bread is steaming and fragrant enough to get your appetite going, with its savory, lovely smell. I have to say it's hard to find a smell better than baking bread or fresh baked goods. I chose this for my appetizer, seared foie gras, with a seared apple slice and an apple reduction. 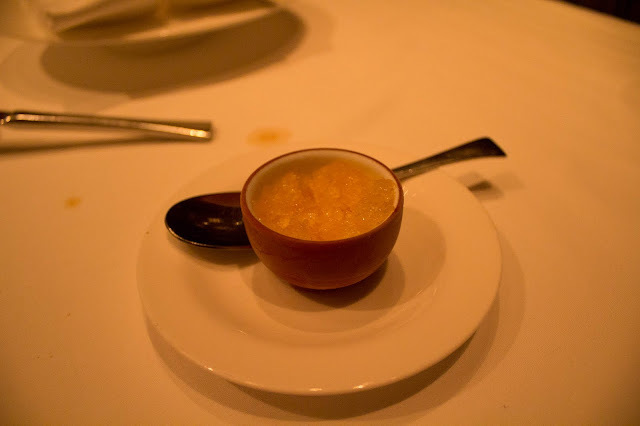 I love foie gras, my heart is going to hate me for it, but I do enjoy the thick, decadent, palette covering flavor that accompanies engorged duck liver. Since foie gras is so rich and oily it is usually paired with something sweet, pears, apples, peaches, etc.) 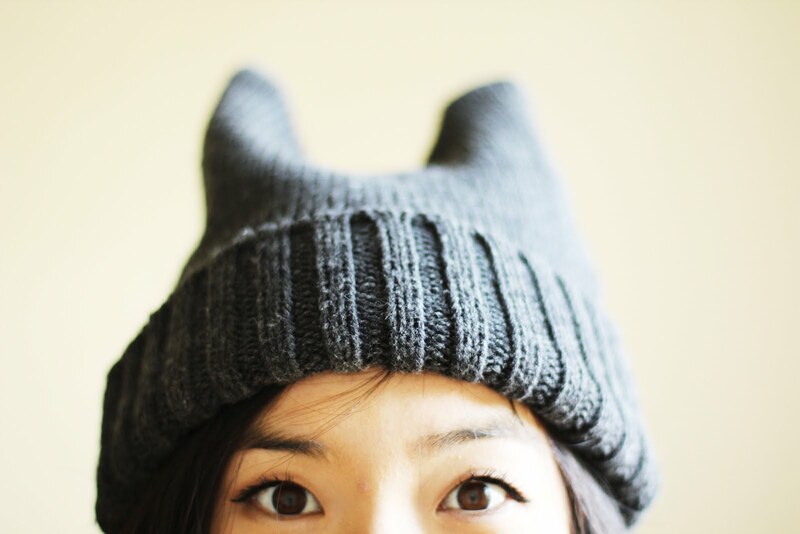 for an accompaniment. In this particular case I loved everything on the plate, although it seems very simple in presentation, it is actually relatively difficult to execute. Since foie gras is essentially 100% fat, it's easy to overcook it by accident...and then you either end up with a hard puck of foie gras or a pool of fat in the pan. Ick. 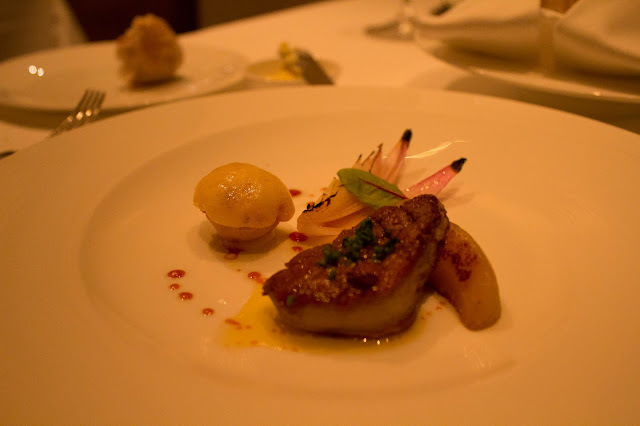 The foie gras in the picture was perfectly cooked with a light crusty outside and a juicy, succulent middle. There was a good balance of sweet and savory with the fruit and meat elements of the dish. The only thing that I didn't really like was the "fruit foam" that came with the dish, it's in that little half-circle on the left-hand side in the picture. It was way too acidic and a bit bitter after the delightful umami bomb that hit my mouth. This lovely little cake is what my dad ordered for his appetizer. 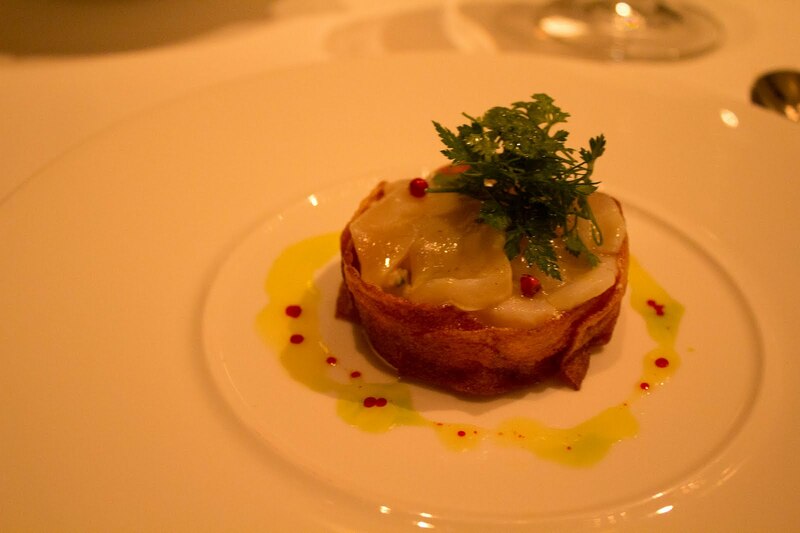 It's a fresh scallop cerviche, wrapped in bacon, and garnished with pink peppercorns. 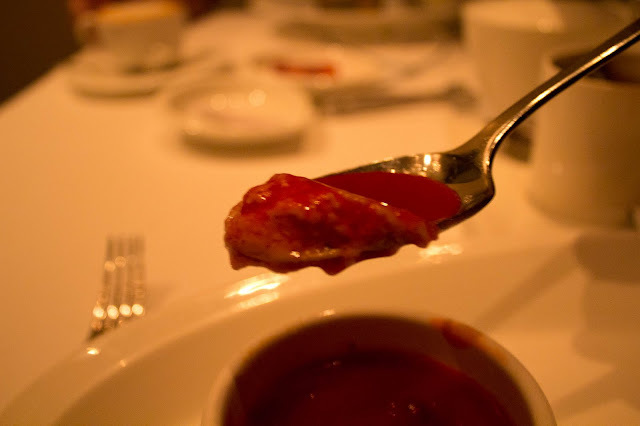 While I only had a bite of this one, much to my chagrin, the ceviche was as equally balanced in flavor as the foie gras. Although I should probably say, that this option leaves a much lighter impression on the palette. It's hardly as rich as the foie gras, but the pure, fresh sweetness of the raw scallop enchants in its own way. It was perfect paired with the salty, crunchy bacon. There was enough bite and textual difference within this dish to keep my dad and I amused, without making the cerviche overly mushy. I chose the French Onion Soup, for my soup/salad portion. 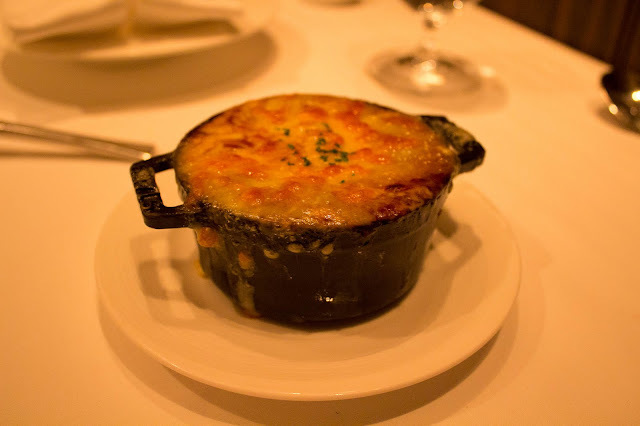 Although french onion soup is one of my favorite soups in the world. I do find that many restaurants have the tendency to make french onion soup overly salty and entirely un-enjoyable. However, this little molten hot French Onion Soup was a joy to eat. It was beefy, salty, robust, and yet allowed the sweet taste of the caramelized onions to come through. The top was broiled to perfection with the melted combination of Gruyere and Mozzarella cheese on top, with soft, soup soaked baguette just nestled underneath it. Be careful not to be too messy though, if you spill this soup anywhere on exposed flesh or otherwise it will burn you. BURNZ. 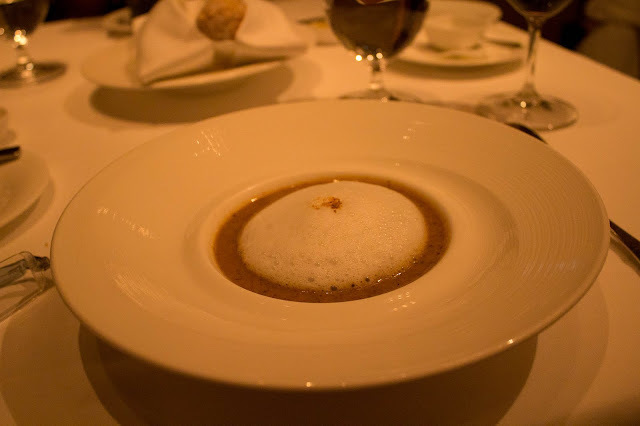 This was my father's choice of soup a cappuccino, mushroom concoction, a very popular trend in restaurants lately. I've been seeing a lot of mushroom, cappuccino options on the menu. =PThe combination of cappuccino and mushroom soup doesn't sound very delicious, but wait until you try it. This was just the guava palette cleanser. Simple and icy, it prepared us for the next course. STEAK. Before your steak comes out of the grill and gloriously to your table, the waiters and waitresses very ceremoniously bring out this container of salt so you have the option to have the option to season your meat if you so choose. 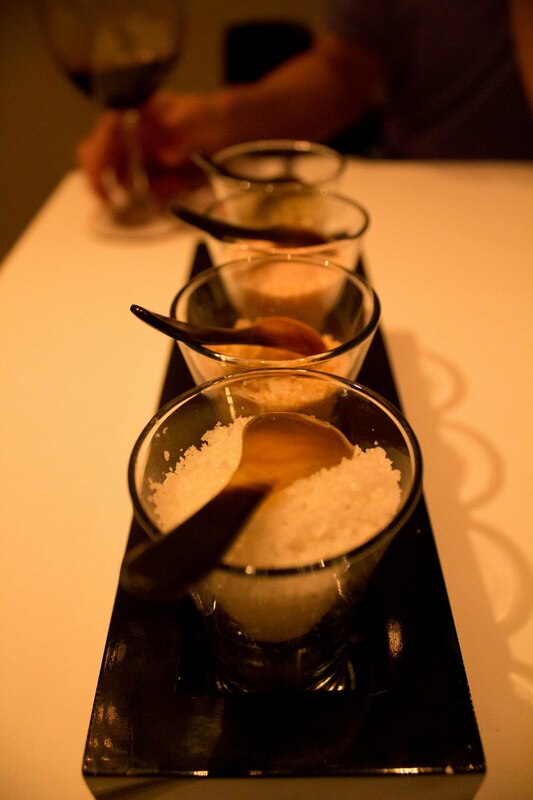 There's fleur de sel, Spanish black salt, pink Hawaiian salt, and Himalayan rock salt. 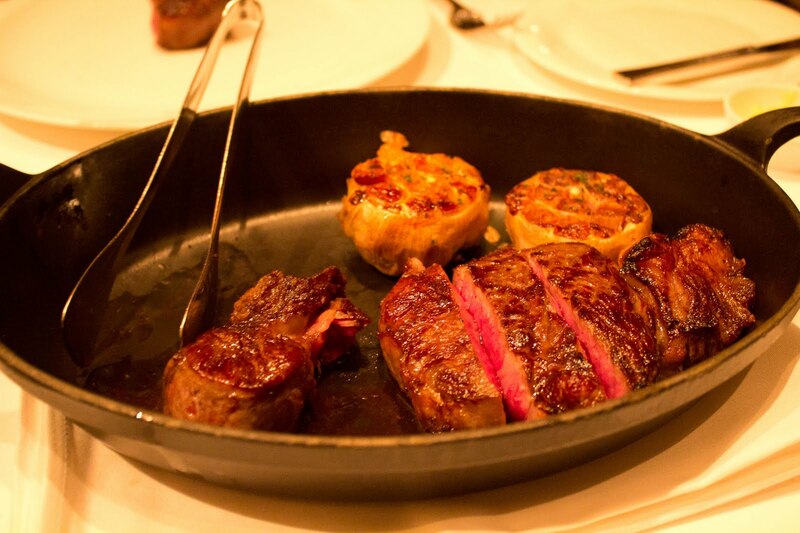 The steaks are served on an incredibly hot skillet accompanied by two oven roasted heads of garlic. This particular cut of steak, the Harris Ranch Natural New York Steak, is a favorite staple of my family. The chefs at A Cut always manage to cook the steak to perfection, we often opt for medium rare, but at least 50% of the flavor does depend on the natural flavor of the beef. This time the stars aligned and granted my father and I the perfect meal, the perfect beef, and the perfect execution. The beef had loads of natural flavor and it was juicy, yet tender....it had a perfect seared crust....ah! My mouth is watering just writing about it. In fact, I love these potatoes so much that my dad gives me his. >< I get two servings! Woohoo! 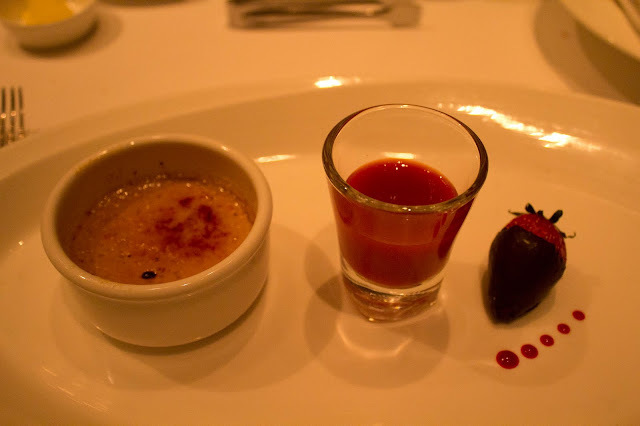 For the dessert, I ordered a vanilla crème brûlée that came with a strawberry puree and a chocolate dipped strawberry. Honestly, I'm very particular when it comes to creme brulee, but this was the perfect finisher to the night. 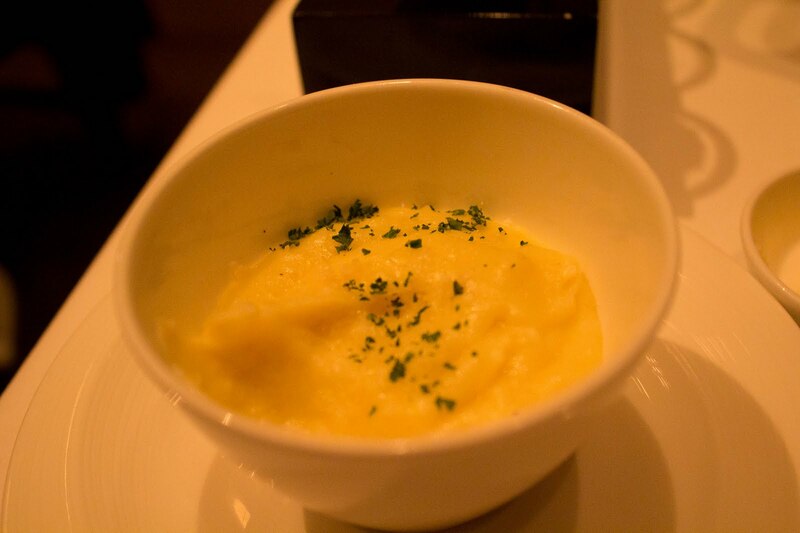 The strawberry puree was fresh and light, and mixed perfectly with the sweet creaminess of the vanilla custard. I think it was Amelie who said breaking through the sugar crust of a crème brûlée was one of the indulgent joys in life. She was completely right. A close up on deliciousness. Anyway, if you're ever in Taipei and want a nice western meal I encourage you to go here. I love it and I hope you do too. Kid Friendly: Yes, the waitstaff are very attentive when it comes to children. @Chyrel Awesome! I wish we could dine together too. <3 =) Happy late birthday and I'm glad you enjoyed your meal!